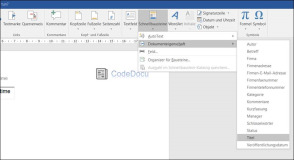 Sample code to change the Title value as a variable in Word with a Textbox Control. 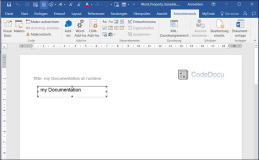 In Word you can import and modify internal and user-defined variables directly in the document. Internal variables can be externally best with Title. If you want to use a property directly in a document as a variable, you can use a textbox control for the input in the example shown and adjust the title as you type in the textbox element. The advantage of using MS Word document properties is that they can also be viewed directly in the file explorer. This makes it easy to manage Word documents via the File Explorer. As you can see, authors, categories, markers, and titles are placed directly in the file overview. Author, subject, company, company address, category, comments, summary, keywords, status, title.